Arizona Fire Crews Hold Ground In Resort Town Homes, cabins and lodges in the resort community of Greer were saved by crews, and improved weather helped them make progress against the massive blaze. A plume of smoke rises from the Wallow Fire burning near Springerville, Ariz.
Fire crews in Arizona managed to hold their ground Thursday at the resort community of Greer, saving homes, cabins and lodges by holding back a massive blaze that has burned through hundreds of thousands of acres. The fire, which has become the second-largest ever recorded in Arizona, destroyed a half-dozen homes in Greer, but firefighters were able to protect the main part of the town, fire information officer Suzanne Flory said. "Firefighters had a good stand, but structures were lost," she said. Fire officials that had been worried about damage to power lines carrying electricity to neighboring states said there now appeared to be no immediate threat to the grid. But a fiber-optic line could be damaged, cutting phone, cellphone and online service to the area around the fire. Fire crews were hopeful that they could slow the flames Thursday with an improvement in the weather. Cooler and more humid conditions prevailed after days of driving winds — including gusts of up to 45 mph. No high-wind warning was issued Thursday. "When dawn broke, it was real cloudy with lots of smoke and there was very little wind, which is a good thing for the firefighters," said Capt. Jim Wilkins, a fire information officer, from the scene of the fire. "Today, we are working very diligently to complete the lines that would separate the fire from Springerville and Eagar and to hold those lines," Wilkins said. "We're cautiously optimistic that today's the day that we're going to get on the scoreboard." 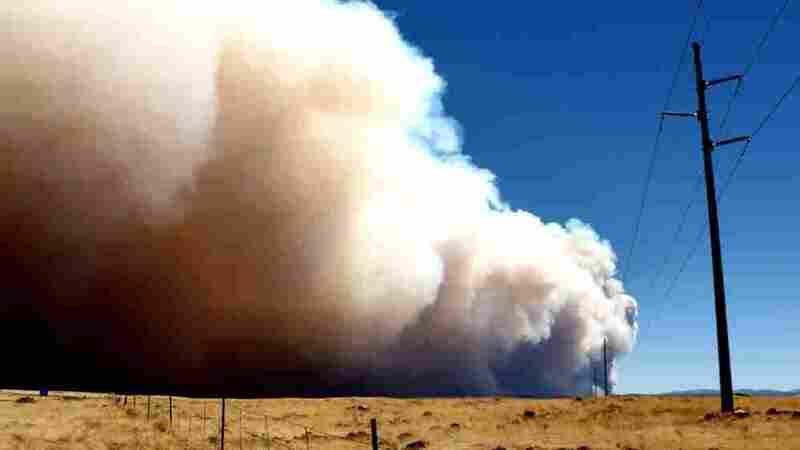 Residents remaining in two towns — Springerville and the neighboring community of Eagar — that lie in the wildfire's path were ordered to evacuate their homes Wednesday after a spot fire popped up on the northwestern edge of the Wallow Fire. Officials feared that the fire might hook around a bulldozer line and a burned-out area and race toward Springerville. Apache County sheriff's deputies and other law enforcement officers went house to house in the town looking for any residents who hadn't left. Some 3,000 firefighters from across the country were helping battle the blaze, which had destroyed 11 structures and burned more than 360,000 acres so far — a figure that was revised downward based on better mapping, said Peter Frezen, fire information officer with the Southwest Area Incident Management Team. The damage so far has been primarily in the primarily in the Apache-Sitgreaves National Forest. No serious injuries have been reported. Frezen said there was room for optimism with the change in the weather, but that the fire was still spreading. The blaze, burning in mainly ponderosa pine forest, was sparked May 29 by what authorities believe was an unattended campfire.